I have been indulging in some much deserved quilting time now that I'm home for almost two weeks. My 4-6 am time is the most treasured time of my day. Life doesn't get much better when you get uninterrupted sewing time with a hot cup of coffee and jammies first thing in the morning. I'm working on several small teaching pieces...this not only helps me in the classroom but also provides me with the handwork I need to keep myself busy on an airplane. 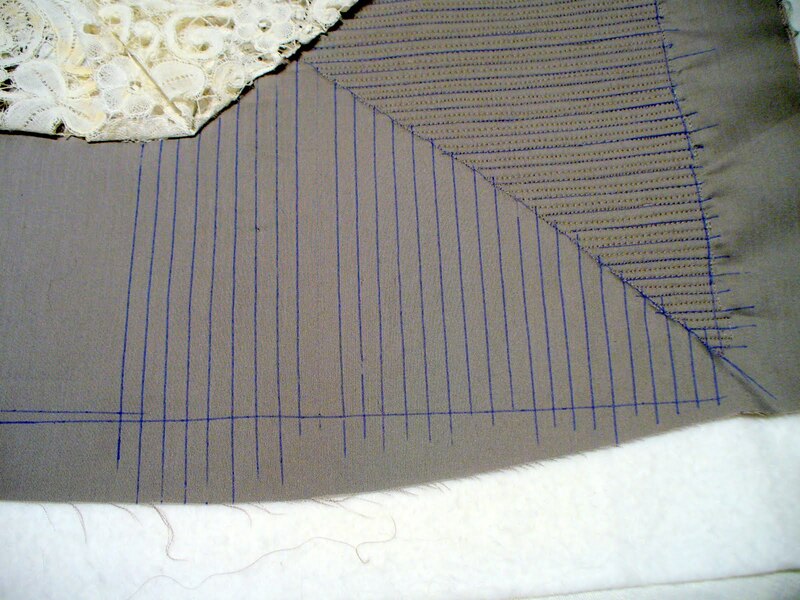 I blogged about this hankie in the previous post and wanted to share some techniques. I used the new stabilizer I talked about before and LOVE it! 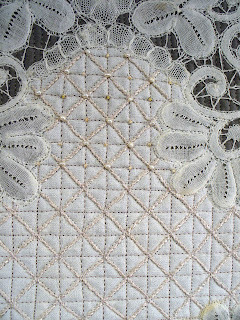 I hand embroidered the gridwork on the hankie with 16 wt. 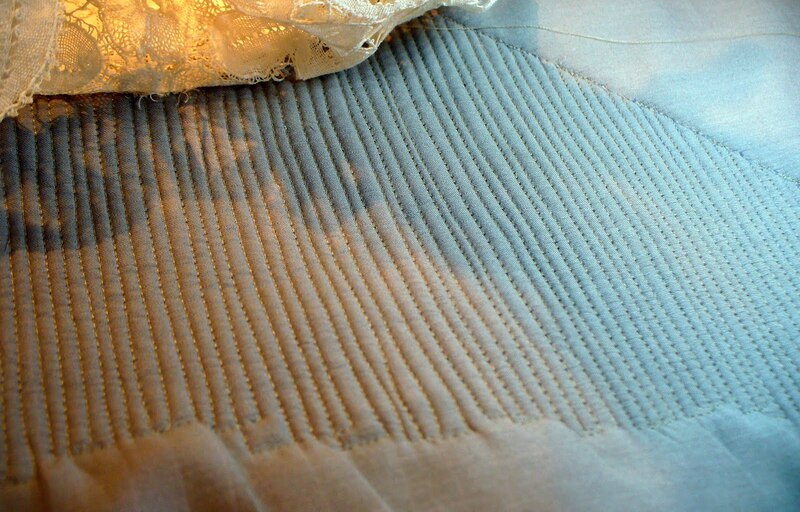 silk from Superior Threads in a split back-stitch and then machine quilted with a 100 wt. Kimono Silk for the crossed lines in-between. 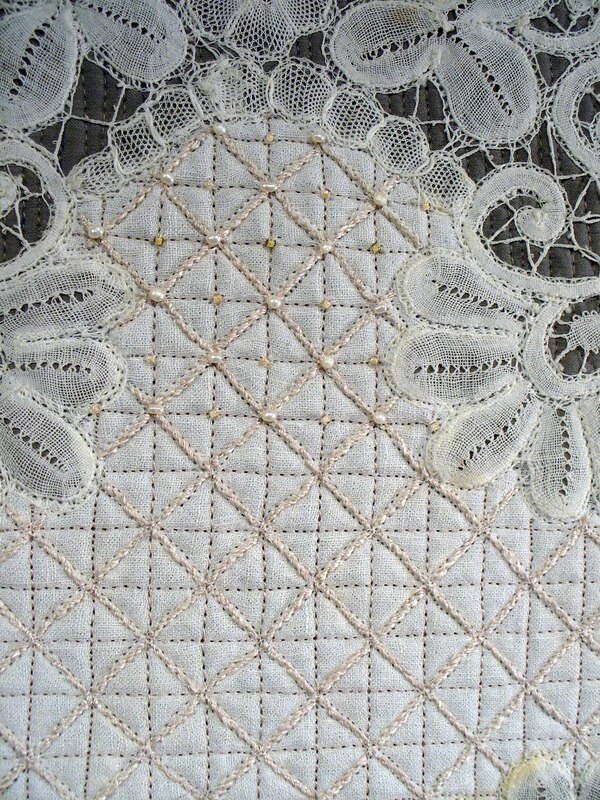 I've learned through trial and error that it is smart to quilt UNDER lacework first and then lightly tack the lace down over the top of that. 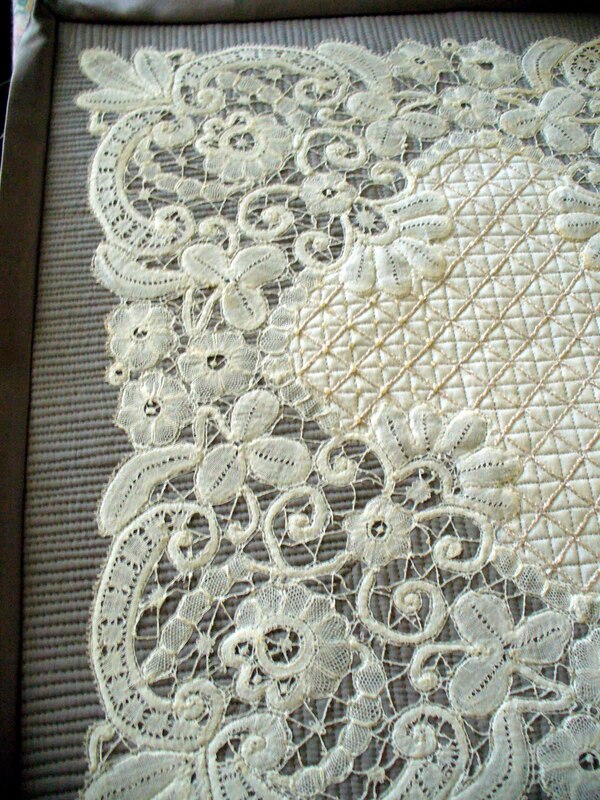 The beauty of lace is in it's texture. 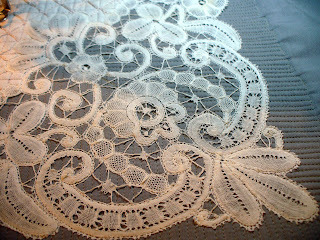 If you heavily quilt lace it smashes it down and it loses it's beauty. Trust me...I've lost a few beautiful lace pieces by trying to quilt it too much. 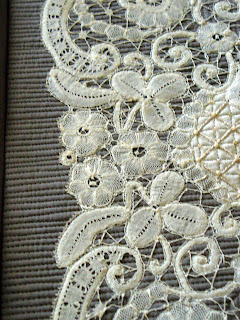 For this piece I marked 1/4" lines underneath all the lace work (I folded the lace over to expose the fabric). 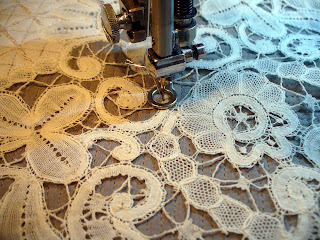 I free motion quilted these lines with Bottom Line thread (Superior Threads) and then went back and filled in again to make the distance about 1/8". I do these lines free motion as I don't want the lines straight...I want them a bit wiggly as I'm after the texture. Once all the under-texture work was done I folded the lace back in place and then lightly free motion quilted the main lines of the lace down with Bottom Line thread. 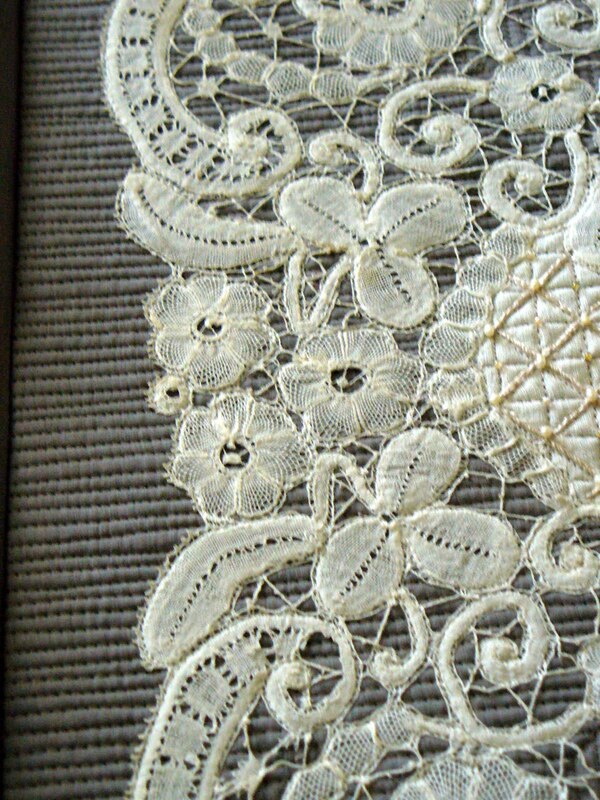 I will go back and add beautiful tiny fresh water pearls and little beads to embellish the lace just like I'm doing in the middle. This has been a fun, small project and will be great in the classroom for a teaching tool. This is also a great idea for a small gift that doesn't take oodles of time. 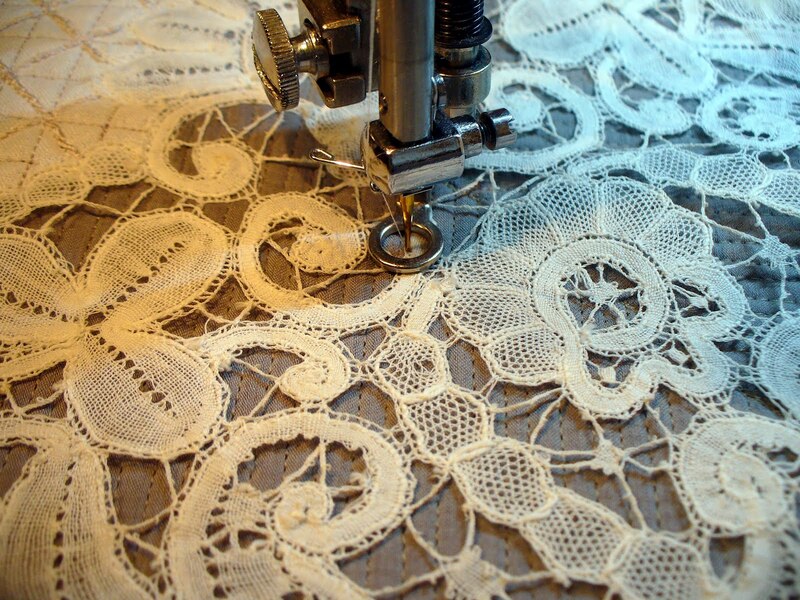 Thank you for sharing the tip about quilting UNDER the lace. The piece is beautiful! This is so beautiful...and thank you for the step by step pics! Cindy....this piece is stunning! And thank you so much for the tutorial on how you did it.....I'm so inspired! I know I have some odd pieces of battenburg around here somewhere....I off to find them and see what I can do! Thanks so much! Wow. WOW! Thank you so much for sharing your incredible work! Could you share the back so we can see just how much stitching you did to hold the hanky? Your work - art - is beyond words.